After I found out I was having twins, I started looking for some children's books that have twins as main characters. For the most part, all that is available for kids only have twins in the book and never a big sister like my twins have. When I was contacted to review the Paris books giveaway, I said yes thinking that Isabella would love to read some books about a girl who has twins for siblings. 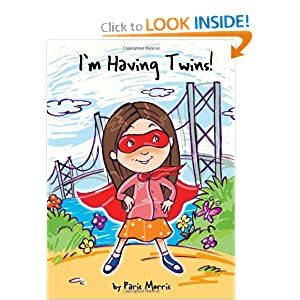 The Parris books were created by young teenage author Paris Morris, the books follow her as she welcomes her baby twin sisters home from the hospital, grows up, and travels with her family to various cities and destinations. In the destination books, your kids will learn all about the city and the fun things that Paris and her twins sisters do in the city. The twin books are all about Paris and how she handles having twin sister. I was sent three books to read with my kids; Paris Goes to Lake Tahoe, Paris Goes to San Francisco, and My Twins First Birthday. The books are so cute and very colorful! Isabella loved them and her favorite book was Paris Goes to Lake Tahoe. She said that it was her favorite since she remembers going there when she was a baby. I thought that was pretty cute since she was 9 months old at the time, but who am I to argue? I love that the books read exactly how a little kid talks. I thought that was the best part of the series. Having the character voice sound like a kid is one of the reasons I think my kid likes the books so much. I love that the whole page is an illustration and that the pictures are so vivid. I really wish I had the I'm Having Twins book when I was pregnant. It was so hard to explain what was going on to a 1 year old. I really think this book would have helped her not pout so much when the babies came home from the hospital. Want to buy some the of the Paris books for yourself? They are available on Amazon's website. You can find out more about the Paris book series on the My Friend Paris website. One lucky reader will win some of the Paris books for themselves. This contest is open to US residents and only entries on the Rafflecopter form will count. Disclaimer-I was sent three book to facilitate this review. No further compensation was provided and all opinions are 100% mine. Paris goes to Italy looks great! I love the travel books!! We travel a lot as a family and love to read about different destinations! i would like to read the travel books! especially the one in new york! My Twins’ First Birthday! I have twins so I love sharing this them with them. p.s. your pinterest links aren't working, in the RC and on the sidebar. Shows a 404. Paris Goes to Los Angeles sounds fun!